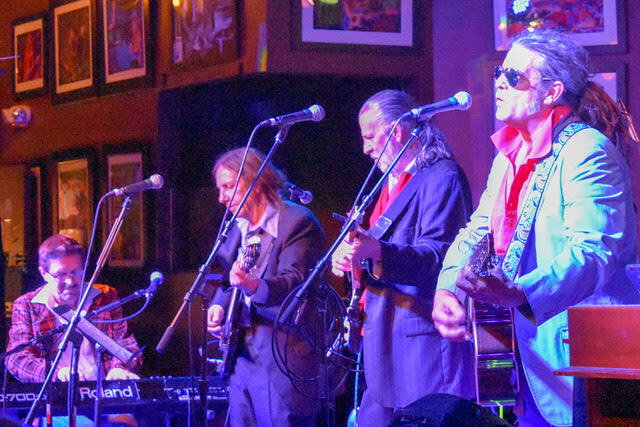 Boynton Beach-based singer/songwriter Jerry Leeman has presented his live, abridged interpretation of The Last Waltz, director Martin Scorsese’s iconic 1978 documentary about the farewell concert by The Band, several times at different South Florida venues since 2002. 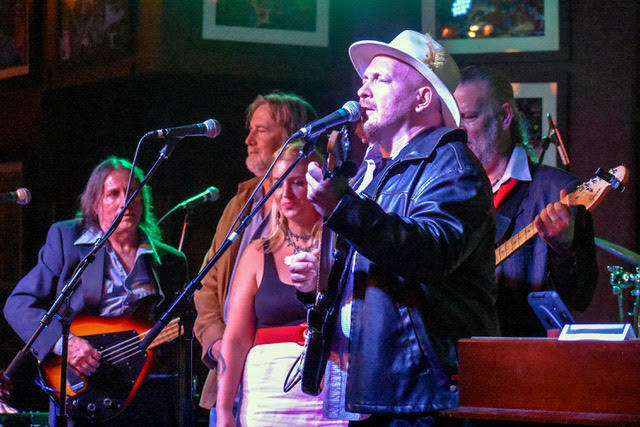 The latest installment — with Leeman playing four different roles amid an ensemble of area all-stars — occurred Nov. 21, the night before Thanksgiving, at the Funky Biscuit in Boca Raton. The occasion was the 42nd anniversary, almost to the day, of the concert filmed by Scorsese at the Winterland Ballroom in San Francisco on Thanksgiving Day of 1976. And Leeman’s shape-shifting Big Medizen ensemble capably captured the performances by drummer/vocalist Levon Helm, keyboardists Garth Hudson and Richard Manuel, bassist/vocalist Rick Danko, and guitarist/vocalist Robbie Robertson, The Band’s only remaining surviving member, along with a scroll of international guest stars. Sung by Lavezzoli, and featuring the additional three-piece horn section of saxophonist Dave Kupsick, trumpeter Seth Merlin and trombonist Jason Pyle, the opening number incited an audience that would have few reasons to settle down afterward. Henze took lead vocal chores on the subsequent, raucous “The Shape I’m In,” followed by the first guest appearance. Vocalist John Harris portrayed singer Ronnie Hawkins on a cover of Bo Diddley’s “Who Do You Love,” as he would later on vocals and harmonic to portray Paul Butterfield on another cover of a blues chestnut, Junior Parker’s “Mystery Train.” Jones then sang the ballad “Makes No Difference,” featuring strong accompaniment by Schmidt, a tasteful instrumental and vocal force all evening. 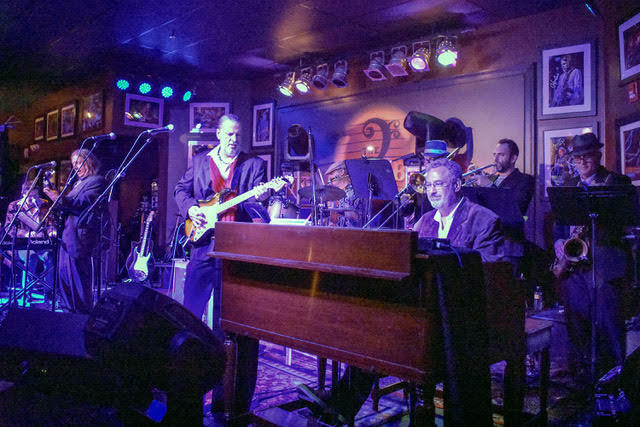 Vocalist/keyboardist “Motel” Mel Seba’s portrayal of Dr. John, on the New Orleans gumbo-laden “Such a Night,” was letter-perfect enough that it could’ve perhaps only been followed by the first of four impressive appearances by Leeman. Playing guitar and harmonica as Neil Young, with Kristin Cappiello singing backup as Joni Mitchell, Leeman nailed Young’s nasal, high-register vocal phrasing on the ballad “Helpless.” Later, he would don a jumpsuit as Neil Diamond to croon “Dry Your Eyes;” mimic Van Morrison’s unorthodox, soulful Irish voice on the sing-along “Caravan,” and growl his way through “Mannish Boy” as Chicago blues legend Muddy Waters. If Leeman provided many of the highlights, the intermittent, filmed spoken sequences from The Last Waltz were the only moments that did the opposite. In previous presentations, Leeman had the capacity for a full-size movie screen and full-sounding audio to boot. This time, there was only room for a projector screen, and much of the dialogue was buried and unintelligible. Thankfully, those moments were few and far-between. 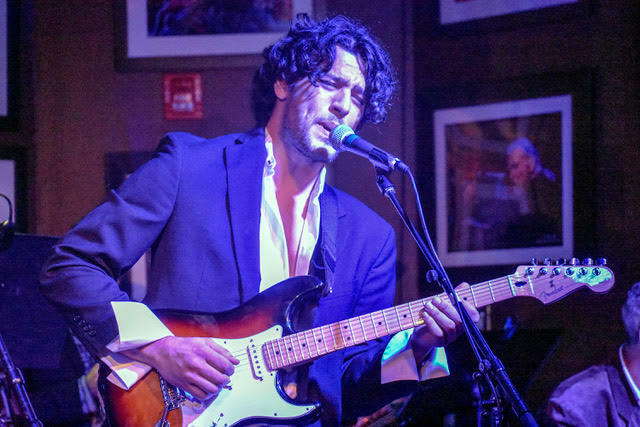 Guitarist/vocalist Shaun Rosario admitted to being nervous about portraying Eric Clapton before the performance, and it showed early on in the cover of Bobby “Blue” Bland’s “Further On Up the Road” when he stepped on his guitar cord and unplugged it. But he righted things with a strong vocal, plus solo trades with Schmidt, even if Rosario’s passages were curiously low in the mix. The horn section members all got solos as well, highlighted by Merlin’s. Guitarist/vocalist Mike Hill then closed the show by accurately mimicking the otherwise inimitable vocal phrasing and timbre of Bob Dylan, the artist most associated with The Band, since the quintet initially rose to fame as his backing group. The ballads “Forever Young” and “I Shall Be Released” featured the ensemble cast singing harmonies, along with the crowd, to cap an overall performance that would’ve made Robertson, and his departed Band mates, very proud.